With over 25 years experience in working with breed clubs, Jeanne Flora's resume includes more illustrated standard projects than any other single artist in the field. Dog art is my full time occupation and it is my life. I wouldn't have it any other way. People sometimes ask what led to the preoccupation with illustrated standard work. My work is the result of a life which has always revolved around animals and expressing an ongoing fascination with structure through art. Illustrated standard projects are the "perfect fit" and the aspect of my work which is the most fulfilling. I learned to walk using one of the family dogs as a prop and was riding horses at age four, which led to active competition in both dog and horse sports from an early age. The association with dogs and horses taught me structure, the relevance and importance of function in harmony with form, and the rewards or compensations dependent upon it. Artwork has always been a part of my life, from childhood through present day. I have studied anatomy and structure through experience and an obsessive collection of reference material as it pertains to those animals. My personal library of anatomy and reference books now exceeds any logical space. The quest for learning how and why something performs as it does will always provide something new to discover. Art, as it applies to illustrating the anatomy of animals for educational purposes, is quite a small field within the general art world. As a young adult, I acquired my first Doberman Pinscher, discovered dog shows, and began showing my own dogs, all the while doing commissioned portraits, primarily in pastel or pencil, as time allowed. 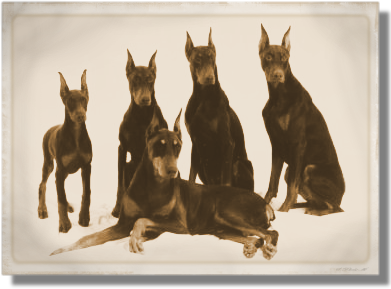 I have bred Dobermans on a limited basis, producing and finishing champions in the breed with a focus aimed at the importance of good genetic health and structure. The photo to the right represents 5 consecutive generations, ranging from approximately 4 months to 12+ years. In 1980 I began showing additional breeds and handled professionally until 1990 (at the same time working as a medical office manager and doing commissioned artwork), exhibiting dogs in all groups. It was in 1990 that I made the transition to a full time, self employed artist. 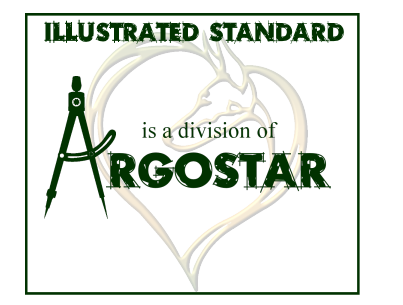 Commissioned art work increased rapidly after taking concession space at a dog show, and Argostar was officially launched. Although my work includes illustrations and clip art volumes which are marketed to the general public, the majority of time is spent on private commissions for individuals and clubs in the way of logo and illustrated standard work. Each aspect is something which is entirely different in style, theme, and purpose. You will find the body of my work prior to 2018 bearing the name Jeanne Flora. With marriage, the name has now changed to Williamson. The work continues under the new name. Illustrated standard projects are most important to me and I consider it an honor to have been selected to do those illustrations by the following breed clubs. The quest to illustrate the vision of any group is often a difficult task, but can be rewarding for all involved. By the nature of interpretation, there will never be complete agreement on the ideals set forth for any particular breed. It is our job, working together as committee and artist, to provide the best and most informative presentation possible using the resources that are available to us. I am proud to have been associated with so many fine clubs and knowledgeable individuals who work tirelessly toward these goals.